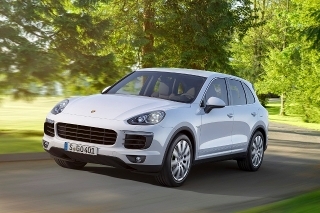 Porsche reckons it might have tackled a collection of seemingly competing needs with the Cayenne S e-Hybrid. Not only does it profess to be a high-performance luxury car with real off-road capability, but it’s also a “green” vehicle with it. That the technology under this recently-facelifted model is impressive should come as no surprise. For a large SUV, the Cayenne has the agility of a much smaller car, cornering flatly and with the precision that you’d want from a Porsche badge. 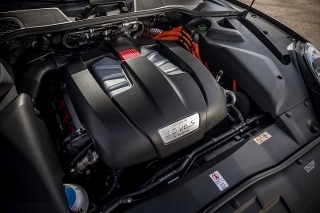 Press the throttle to the kick-down switch and the combination of 3.0-litre supercharged petrol engine and electric motor provide a storming 416hp and propel its 2.4-tonne mass to 62mph in less than six seconds. It’s all very impressive. Individually, the two power sources are no less impressive. The electric motor, which can drive all four wheels, produces the whine of a tightly-meshed mechanical parts as it moves through the Tiptronic gearbox’s eight ratios and doesn’t feel overwhelmed by the bulk it’s carrying. Once the battery is depleted, petrol power kicks in with a smooth and sonorous growl. It’s also not short on luxury. Ride quality ultimately comes down to how much you spend on suspension and wheel upgrades – it’s possible to fit 21-inch rims under those arches – but it’s quiet and comfortable at high speeds and doesn’t crash over rough surfaces or speed bumps. 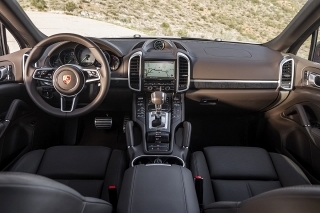 Despite its focus on performance, the Cayenne is as comfortable as any other large SUV and can be taken as far off the tarmac as your nerves will allow. This also opens some new doors for Porsche in fleet. 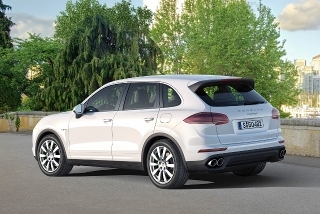 With CO2 emissions of 78g/km, the Cayenne slips onto limited-emission choice lists, if not under the threshold for London Congestion Charge exemption and eligibility for the £5,000 Plug-in Car Grant. Not that the latter makes much difference here – the hybrid is priced to match the diesel-powered Cayenne S, but with a significant reduction in Benefit in Kind tax for drivers. That’s only half the story, though. Fully charged, there’s enough power in the battery to cover around 16 miles on electricity before the petrol engine kicks in. And with weight, aerodynamics and the drag of four-wheel drive against it, this isn’t a particularly efficient car when driven over long distances. The ability to shut the engine off while under low loads helps lift economy to around 30mpg – by no means unimpressive for a large petrol SUV, but some way short of the diesel. 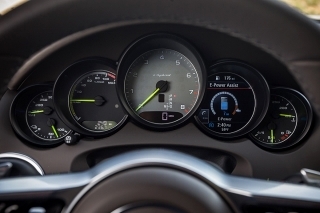 As an added disadvantage, the Porsche takes a minimum of 1.3 hours to recharge with the upgraded on-board charger, or 2.7 hours without it. So it’s a car which will suit certain drivers very well, but it’s worth doing the sums before being swayed by its tax advantages. That’s not a reason to dismiss it, though. 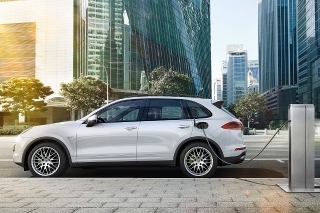 The Cayenne can charge its own battery using the petrol engine, offsetting the blunted fuel economy by enabling drivers to cover urban routes using the electric motor. It’s a shame that this doesn’t enable it to get into Central London without a charge, though. So the Cayenne S e-Hybrid makes sense for a distinct group of drivers, but it has plenty of competition for their affection. Audi, BMW and Mercedes-Benz have plug-in hybrids on the way, and Volvo’s new XC90 will have something similar by the end of the year. But for the badge cachet and driver involvement, this carbon-cutting Porsche offers the best of all worlds. A short electric range, long recharging times and a large petrol engine as a backup mean the Cayenne’s tax savings are eroded by fuel costs for long-distance drives. But they’re not issues unique to the Porsche, and there’s plenty of corporate appeal for those with the right sort of usage.